Maisie Jane’s Nut Butters Are Dressed to Impress: Same Great Taste, Bold New Labels! With this year’s summer season of adventure comes brand new labels for the same great tasting products you know and love from Maisie Jane’s. As you prepare to fuel up for your next adventure, whether you’re a trailblazing adrenaline junky, a health nut, or the supermom picnic packer, keep an eye out for the fresh new labels on Maisie Jane’s Natural, Organic, and Handcrafted protein rich nut butter products. It’s a black-tie occasion for these powerhouse nut butters! Dressed to impress and packed with nutrient-rich almonds, the same great flavor, and smooth creamy texture, these all Natural butters boast a new sleek black label band and are available at your local grocery store all summer long. Don’t panic, it’s Organic orange for these healthy delicious nut butters. These delightful jars of wholesome goodness stand out for what they DON’T have in them and are a go-to protein heavyweight for families, hikers, trail bikers, and everybody in between. Looking for a healthy alternative to peanut butter? 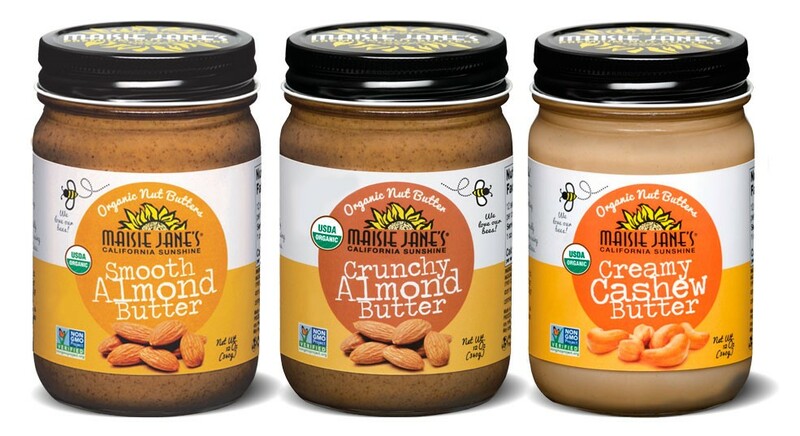 Go for Maisie Jane’s Organic nut butters with an orange label band! It’s back to the basics for Maisie Jane’s Handcrafted nut butters, all wrapped up in color relevant labels and simple black circles. These dreamy jars of pure nutty goodness remind us that when it comes to great quality food you can trust, simple is always better. With family tradition and good ol’ fashioned flavor you can taste, these handcrafted beauties are recognizable on your grocery store shelves with iconic black circles on a colorful label band. Keep an eye out for the green USDA Certified Organic label on the front of Maisie’s jars. Going organic is always a great option! Most of Maisie’s nut butters are made with one ingredient only: ALMONDS! Our Handcrafted nut butters are made with select wholesome ingredients, so look for the ingredient list underneath the nutrition label. Located on the back of each jar is a helpful nutritional fact label that outlines nutrient percentages and serving size. Maisie Jane’s caters to all sorts of dietary types and foodie preferences! You’ll notice the brown Gluten Free, 100% Vegan, and Dry Roasted labels, right by our story description on the back of the jar. Good news! Almonds are, by nature, Non-GMO! The Non-GMO Project Verified label is one we proudly place on the front of our jars. 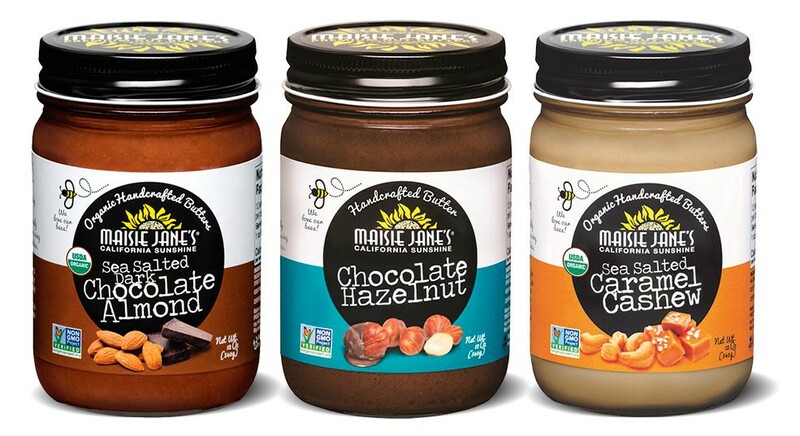 All of Maisie Jane’s nut butter products are certified Kosher by the EarthKosher certification process which is congruent with Kosher Industry Standards. Nobody likes a nut butter gone bad! Be sure to check the Best If Used By date to the right of the barcode. 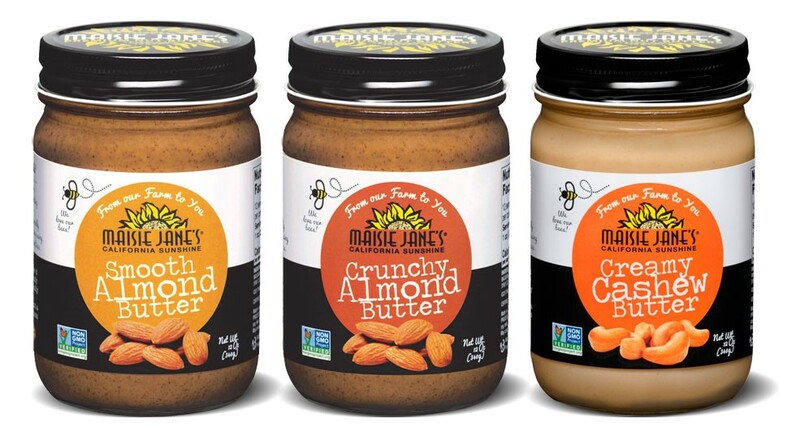 Whether you prefer the Natural, Organic, or Handcrafted Nut Butters, these classic Maisie Jane’s products offer you the freedom to live a healthy and delicious lifestyle, and can be found with their shiny new labels at your local grocery store, online at Maisie Jane’s, or at Maisie’s friendly gift shop in Chico, Ca. Ready for the cherry on top? Follow our blog for mouth-watering recipes and updates! With valuable insight into the best ways to use our products, how they benefit a diverse variety of dietary needs, and fun recipes for food lovers of all kinds, our blog is a delicious gold mine of information connecting you to the nutty lifestyle we love and support. Speaking of the spirit of adventure, fuel up for your backpacking trips, camping vacations, and summer picnics with Maisie Jane’s nut butters and snacks, and keep an eye out for the fancy new labels!